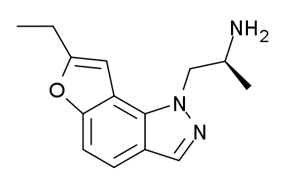 YM-348 is an indazole derivative drug which acts as a potent and selective 5-HT2C receptor agonist, with an EC50 of 1nM and 15x selectivity over 5-HT2A, although it only has moderate selectivity of 3x over the closely related 5-HT2B receptor. It has thermogenic and anorectic effects in animal studies, making it potentially useful for the treatment of obesity. ^ Kimura, Y; Hatanaka, K; Naitou, Y; Maeno, K; Shimada, I; Koakutsu, A; Wanibuchi, F; Yamaguchi, T (2004). "Pharmacological profile of YM348, a novel, potent and orally active 5-HT2C receptor agonist". European Journal of Pharmacology 483 (1): 37–43. ^ Shimada, I; Maeno, K; Kazuta, K; Kubota, H; Kimizuka, T; Kimura, Y; Hatanaka, K; Naitou, Y et al. (2008). "Synthesis and structure-activity relationships of a series of substituted 2-(1H-furo2,3-gindazol-1-yl)ethylamine derivatives as 5-HT2C receptor agonists". Bioorganic & Medicinal Chemistry 16 (4): 1966–82. ^ Hayashi, A; Sonoda, R; Kimura, Y; Takasu, T; Suzuki, M; Sasamata, M; Miyata, K (2004). "Antiobesity effect of YM348, a novel 5-HT2C receptor agonist, in Zucker rats". Brain Research 1011 (2): 221–7. ^ Smith, BM; Thomsen, WJ; Grottick, AJ (2006). "The potential use of selective 5-HT2C agonists in treating obesity". Expert Opinion on Investigational Drugs 15 (3): 257–66. ^ Nilsson, BM (2006). "5-Hydroxytryptamine 2C (5-HT2C) receptor agonists as potential antiobesity agents". Journal of Medical Chemistry 49 (14): 4023–34. ^ Wacker, DA; Miller, KJ (2008). "Agonists of the serotonin 5-HT2C receptor: preclinical and clinical progression in multiple diseases". Current opinion in drug discovery & development 11 (4): 438–45.